Tartan is an art form that can be found in historical specimens throughout Europe dating back over 2000 years. Only in the Scottish Highlands did it survive to develop into the highly decorative multi-coloured patterns that we think of today as one of the traditional symbols of Scotland. 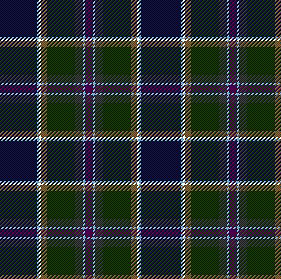 Without a deep understanding of the traditional use of colour in tartan, designing can often be very difficult and the results unpredictable. There are general ground rules governing what colours blend with others and in what proportions. Meaningful and enduring tartan design therefore requires an understanding not only of the traditional techniques of colour combination but also of their proportions and juxtaposition, an appreciation of tartan history and the weaving process. During the past 30 years the studio has produced many tartan designs for use by a variety of clients ranging from individuals and clan societies to organisations and multi-national companies. Some examples of the many designs include; Aberdeen Asset Management, British Airways, Edinburgh Military Tattoo, Scottish Tourist Board, St. Columba, and personal tartans for; Ayre, Belfrage, Herriot, McClafferty, Nichol and Thomas of Craigie. What is involved in the design process? The design process itself in usually fairly straight forward. Designs are tailored to an individual client's demands and can reflect family or corporate themes, connections or affiliations. For example, specific colour combinations and/or shades might be built into a design to integrate it with existing logos or a Grant of Arms. Once specific requirements have been identified then a series of graphic designs is produced for consideration by the client. Though negotiation one or more of these is selected for development and further refinements and narrowing of the selection usually results in a trial design. Very occasionally it is necessary to return to the drawing board. Once the trail design has been agreed and the colour shades confirmed, then a four-yard trial length is woven up. This will enable the client to confirm the acceptability of the pattern, its size and colours. Even at this advanced stage of design it is still possible to make alterations to the pattern. Finally, once the client is satisfied with their design then the pattern is sent to the Scottish Tartans Authority for Recording in their International Tartan Archive and their Certificate of Recording is obtained. 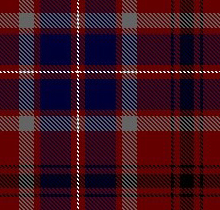 The basic fee is £590, which includes woven samples and submission and recording of the design to the National Register of Tartans. Additional design work is charged at an hourly rate of £50. Other fees may be applicable depending on the proposed use of the design, assignment of design and/or reproduction rights, and the protection of designs by Design Registration.